NETWORK UPDATE: THE OSCARS picked up an extra 0.2 in final numbers, but its 11.0 still put it down 2.1 from last year’s ceremony. All 3 half-hours of the LIVE FROM THE RED CARPET special were down around 2 points once time zone adjustments were made, leaving them at 2.7/4.1/6.4. Elsewhere, the night’s FAMILY GUY rerun gamed 0.1. AMC’s THE WALKING DEAD fared better against the Oscars than against last week’s SNL40 special, rising 0.71 to 6.93 to commandingly take Sunday cable. TALKING DEAD, on the other hand, lost a tenth to 2.42, and COMIC BOOK MEN gained 0.04 to 0.53. In the realm of pre-Oscar red carpet shows, E!’s 7:30 installment was at 1.22, and the network was at 1.09 at 5:30PM, with 0.19 and 516K total viewers for the post-Oscars AFTER PARTY, the latter not on the chart. (E!’s TOTAL DIVAS was up 0.02 to 0.53, and CHRISTINA MILIAN climbed 0.05 to 0.29.) Pop’s coverage (not on the chart) was much punier, with 0.05 in 18-49s and 165K total viewers for its 5PM show and a barely-measurable 0.01/40K at 9:30PM. Showtime took the night off, which may have helped HBO a bit, as LAST WEEK TONIGHT gained a tick to 0.24, JINX rose 0.04 to 0.14, GIRLS was up 0.05 to 0.22, TOGETHERNESS doubled to 0.20, and LOOKING grew by 0.06 to 0.10. 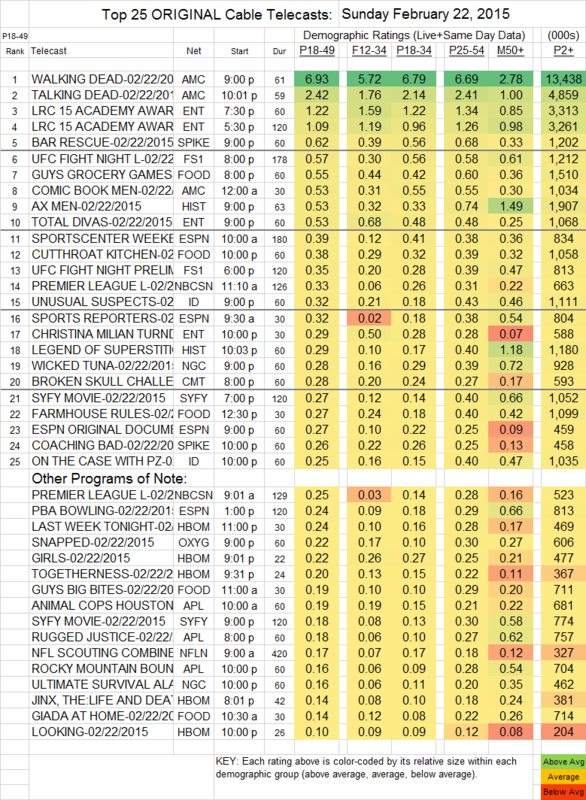 On Spike, BAR RESCUE was up 0.02 to 0.62, and COACHING BAD fell 0.06 to 0.26. On Fox Sports 1, UFC FIGHT NIGHT was at 0.57, and the PRELIM was at 0.35. History’s AX MEN rose 0.06 to 0.53, but LEGEND OF SUPERSTITION fell 0.12 to 0.29.